If you’re a regular user of our website, you have surely heard of BIT Caches. They currently comprise a little over 10% of our active listings. We recently acquired the bitcaching.com domain and it’s small associated website from our founder, Jerry AKA RvRoadTrip, so we figured a blog post about BIT caching was in order. BIT is an acronym that stands for Bound ID Tag, to represent that the game piece is bound in plastic, or laminated. Although it doesn’t necessarily have to be, waterproof self-adhesive media (i.e. sticker paper) has become the norm for the smartphone GPS game Munzee, and it can easily be used for BIT caching as well. Want to learn more about BIT caching? Read on! 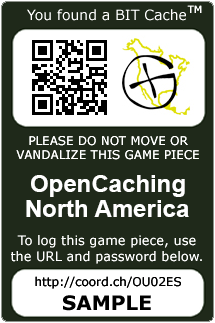 In a nutshell, the BIT cache is a Munzee like game piece used for Geocaching! No container or logsheet is required, although some of our users have put them inside containers. As it says on the bitcaching.com home page, “Endless new hiding places. Endless fun.” They can be hung in trees with zip ties or attached to any flat surface, whether the BIT be the laminated or sticker type. The text “SAMPLE” in our BIT cache example above is replaced with the log password of the cache owner’s choosing. Above that will be the shortened URL of the cache page, as it’s been shown over the years that most of our users who find BIT caches take pictures of the cache in the field for later logging on a computer, rather than writing down the log passwords. The QR code in the upper left hand corner, if scanned with a smartphone, will take you to the cache page on your phone’s web browser for on the spot, in the field logging. No Tftc logs, please. 🙂 That covers all you need to know to find and log them on our site. If you’re interested in hiding a BIT cache for the first time, we’d recommend the How to play pages on bitcaching.com to get you up to speed. First of all, we have never denied that BIT Caching was inspired by the smartphone game Munzee. Indeed the “Cache Idea” thread in our forums in which our founder, RvRoadTrip, announces his intention of the new cache type, was dated August 5th, 2011, 35 days after munzee.com was launched. He said “Not everyone wants to hide a container and not everyone wants to sign a log. Not everyone has a smart phone and not everyone wants one. With these things in mind, I was thinking of a new cache type that might appeal to a wider range of people.” The reference to not everyone having a smartphone was obviously regarding the then brand new game of Munzee. Fast forward almost 4 1/2 years, and just about every Geocacher does have a smartphone, and they are the dominant device used for finding Geocaches around the world. But there are certainly a sizable number of old-time Geocachers who cache exclusively with a handheld GPS, and don’t own smartphones, and they can create, find and log BIT caches. We also believe the concept of a flat, containerless, logsheetless (is that a word?) Geocaching game piece is timeless. A WHOIS lookup will tell you bitcaching.com was registered on 8/6/2011. It was due to expire on 12/28/2015, and our founder was not going to renew it, so he contacted us and asked us if we would like him to transfer the domain name to us. Which was a painless process, seeing as we were both GoDaddy customers. He sent us all the files for the small website at bitcaching.com, we threw them on our server, added a few DNS records, and that too was relatively painless. The website needed an overhaul though, it showed the old version of a BIT cache sample, had a dozen or more references to OCUS, rather than OCNA, and listed Columbus for Android as the only smartphone Geocaching app compatible with our site (there are now 8 apps covering 3 platforms). That overhaul has been completed. So please check out the new http://www.bitcaching.com. And why not go out and find and hide some BIT caches! I’m one of those “old timers with a smartphone”….except I’m no old-timer…and I do have a smart phone. But I don’t have a data plan, and in the field I like to keep moving, and I also like leaving long Found it logs. And that’s why i appreciate the BIT cache as a cache type. Although my kids hate them – no swag to rummage through (even through they always forget to bring along the trade items – and we have a big bin of trade items at home ready for the taking) !